AUGUST 2, 2016 – Front Street Shipyard in Belfast, Maine, has begun construction on the first boat in a new series of center console power catamarans for Brevilla Boat Company. Hull number one is a 48-foot composite catamaran with a 13-foot 10-inch beam and 20-inch draft. The full Brevilla boat line, which includes a range of sizes that are based on a proprietary new hull form, will be available for new construction in the coming months. The Brevilla hull form provides lift, speed, shock mitigation and exceptional handling. The Brevilla 48 will run at speeds in excess of 55 mph with twin 350-hp outboards, operating with a 30-40% increase in fuel efficiency over a comparably sized monohull. The tunnel-mounted outboards are above the boat’s maximum draft, providing propeller protection when running in shoal water or when beaching. Front Street Shipyard is currently constructing both hull and deck tooling for the Brevilla 48. In mid-August Front Street Shipyard will begin constructing the composite hull using resin infusion for efficiency and strength. The first Brevilla 48 will be fitted out as an offshore fishing machine, including a workstation integrated into the center console with sink, cutting board and storage. The boat also will have a T-top, livewells, locking rod storage, built-in coolers and a day head. 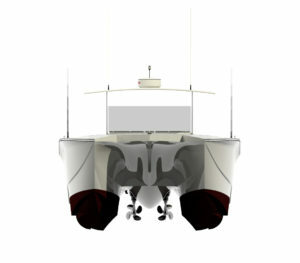 Front Street Shipyard will launch the first test platform of the Brevilla 48 in early October. Designs for additional models in the Brevilla boat line will be posted on Front Street Shipyard’s website as they are made available from Brevilla Boat Company. Prospective buyers should contact Front Street Shipyard for more information and customization options at (+1) 207-930-3740.